The Bigfoot on the Strip is one of the most unique attractions in Branson that offers both indoor and outdoor attractions such as food truck dining park, a large outdoor patio, and party spaces. You will also find in this magnificent fun spot in Branson an array of action-packed ride adventures that include Gravity Bomb, Saddle Sling, Bigfoot’s Adventure Maze, Bigfoot Discovery Expedition and an Action-Packed 8DI Cinema Experience. This $10 million Bigfoot on the Strip offers adventure seekers and folks who don’t just want to enjoy great fun activities but also spectacular views of the Ozarks. Visitors to this fascinating attraction in Branson are sure to spend a relaxing day and watch action-packed movie at the Bigfoot 8DI Action Cinema. This interactive theater at the Bigfoot is one of the best in Branson and features some action-packed adventures that will dazzle and thrill every moviegoer. As you watch a movie with 8DI Action Cinema, you’ll get to experience how immersive this movie adventure is. As you buckle up in your seat and put on your 3D glasses, you’ll be treated to an amazing movie featuring state-of-the-art sound effects, moving seats, and amazing visual effects. Bigfoot’s 8Di Action Cinema provides you with a fully interactive and immersive gaming experience. At the start of the movie, you will be given a pair of 3D glasses as you enter the dark theater. 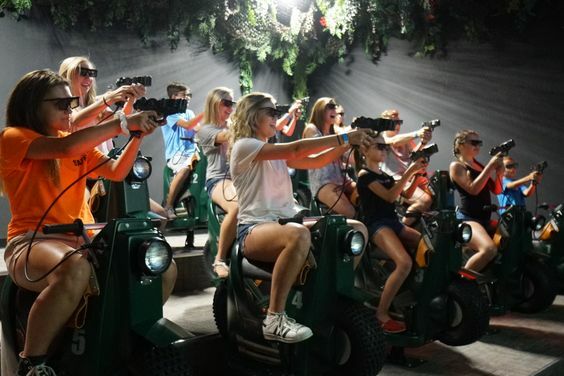 Then you jump on one of the 13 off road mini bikes, grab your laser gun and get fully immersed in the movie for a gaming experience unlike any other. Your bike will sway from side to side during this immersive cinema experience. The 8Di Action Cinema have three different movies to choose from, each with their own features and excitement. Movie fans of all ages will be able to find something to their liking as the movies are G, PG, and PG-13 rated based on content, so visitors are rest assured that there truly is something for everyone. You will find this interactive cinema experience very entertaining while competing with your friends for the highest score. With the Cyborg Cowboys movie, the cowboys have robbed the bank and the Sheriff needs your help to stop the robbers and clean up the town! This rated G movie is perfect for families with young kids. During this movie experience, you will be strapped into a seat and given a shooter where you'll be able to help the Sheriff chase down and stop the Cyborg bank robbers. The movie Bigfoot Breakout (rated PG) is about the Bigfoot and his family that have been taken hostage in a secret laboratory compound deep within the Ozark Mountains. In this PG-rated movie, you will have to help how the Bigfoot and his family can escape. The Mutant Zombie Attack movie (PG-13) is about a compound deep within the Ozark Mountains that has fallen to zombies. It’s your duty to destroy the zombies and eradicate the virus. The 8Di Cinema at the Bigfoot on the Strip is such an amazing attraction in Branson where you can have the opportunity to enjoy action-packed 8Di cinema experience.